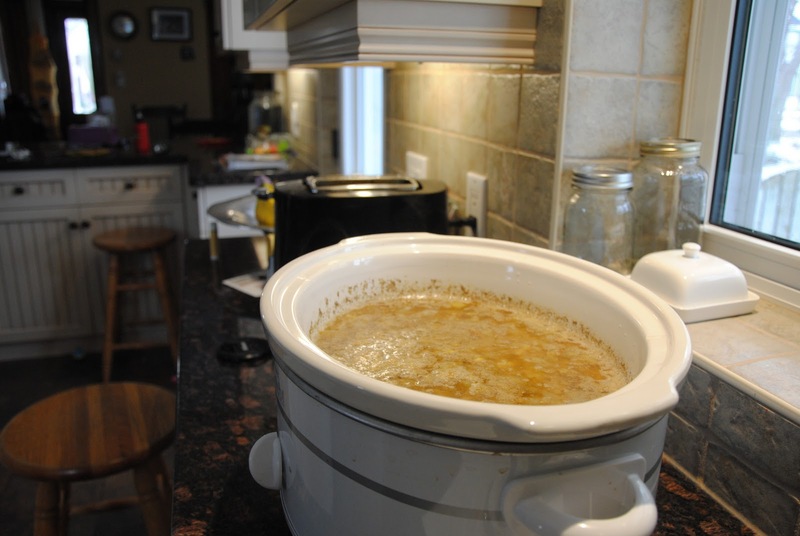 Lentil soup in a crockpot. It's easy to throw together in the morning, fills the house with delicious smells all day, and makes a satisfying meal over rice or with pitas. Top individual bowls with yogurt or sour cream or crema la vaquita, or crumbled feta or queso duro blando. Either soup could just as easily be made in a pot on the stove, with a much-reduced cooking time--about an hour from beginning to end, or until the lentils soften. (You'll note, too, that both soups can be prepared not only as vegetarian, but as vegan). Here are two recipes for the price of one. My kids love both, although AppleApple is not a curry fan, thus making the curried soup a more difficult sell. In a small amount of olive oil, saute 2 chopped onions, 2-4 cloves garlic, and 1 tbsp minced ginger (subsitute 1/2 to 1 tsp ground ginger), and approximately 1 tsp salt. Toward the end, add 2 tbsp mild curry powder and cook off the raw flavour. Scrape into slow-cooker, adding water to the pan to get every last bit out. Black pepper may be added to the mixture, too. Rinse 2 cups of red lentils and 1 cup of green lentils, and add to the slow-cooker. Now here's the ad hoc portion of the recipe. If you like your soup thicker, add about 8 cups of water or broth. If you like it soupier, use more liquid. I use a 3kg container of frozen homemade chicken stock, and add water, following the whims of the day. Cook on low, covered, all day (8 hours or so). Finally, just before the soup is ready to go to the table, stir in the juice of one lemon (or a couple tbsp of cider vinegar). Don't skip this step! It's what finishes the flavour sensation. If you have fresh cilantro, chop and add a bunch at this stage, too. If not, it's still going to taste really good. In a small amount of olive oil, saute 2 onions. When softened, add 1 tsp each: powdered ginger, cumin, turmeric, and ground black pepper. A bit of extra cumin won't hurt, either. Fry for about a minute, then scrape into slow-cooker, adding water to loosen every last yummy bit. Rinse 2 cups of green or brown lentils. Add to slow-cooker. Toss in 1 whole cinnamon stick. And one can of tomatoes--diced or pureed or whole (I use a quart or half-pint jar canned last summer; size doesn't matter). If you happen to have a bunch of fresh cilantro on hand, toss it in, stalks and all (and fish out before serving). Again, the amount and type of liquid added is up to you. I use chicken stock if it's handy, but water is a-okay. Add between 6-10 cups. If you're using water, you'll need to add approximately 1 tsp salt; with chicken stock, you may not need any. Taste before serving and re-season, if needed. Finally, just before serving, stir in the juice of one lemon. Really, it's the secret to many good recipes. Cider vinegar makes an excellent substitute. Note: You are most welcome to add diced carrots or shredded zucchini or other veg to either recipe! I refrain, because that level of mixing and mushing of ingredients does not please my children. I find the most popular slow cooker recipes are those with a short ingredient list. Raw or other cooked veg can be served on the side.